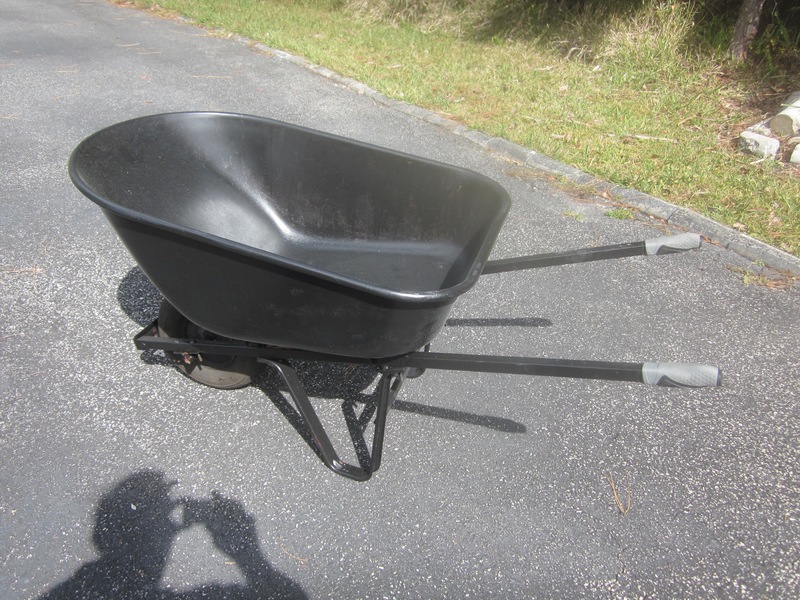 I wore out my main wheelbarrow after only 12 years and was watching for a sale at Lowes to get a replacement. George said he could use the old one for parts so I gladly gave it to him. Instead he decided to do a refurb on this one and several others he had laying around in various states of disrepair. I didn’t think anything more about it until it showed up at my back door, nominally repaired. He didn’t use standard issue repair parts but somehow made it quite useable. I decided to go the extra mile – paint it and get bicycle handle bar grips to fit over the steel square extrusions George had fashioned into handles. Just like new!!! Probably another 12 years left in it. 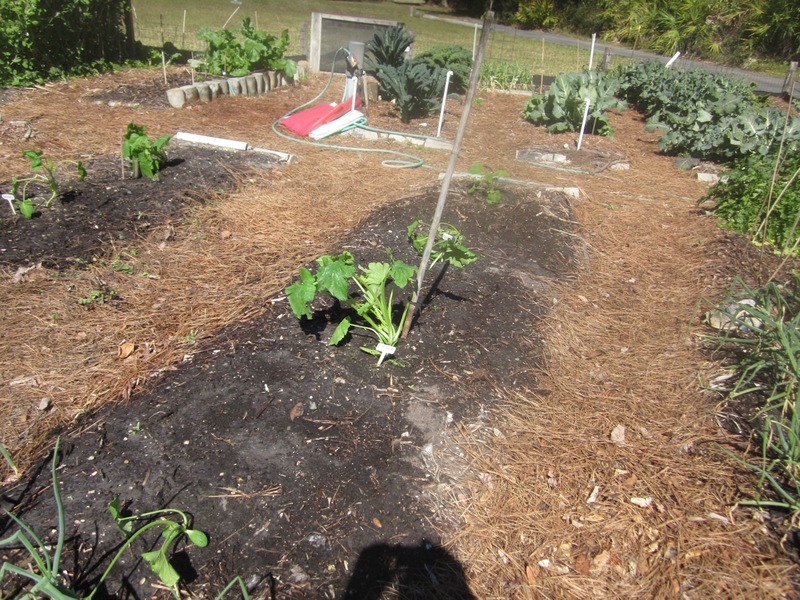 Big day in the garden – removed the walls of water that have been protecting the squash plants. The pic’s show before and after. Feb 28 is the earliest ever for the summer squash. My hope is that we can be picking squash before the bugs ever know it’s there. I’ve got three lines of attack for this year. I’m going to spray with NEEM, a natural insecticide; I’m planting nasturtium seed adjacent to the squash plants, another natural insecticide; and covering the plants with a very fine netting. If this defensive triad doesn’t get it done – the farmers market is the fallback. Nancy attended some major quilt show in Daytona and reinforced my belief that quilters will really buy anything. She literally bought a one pound bag of sand to make a pin cushion. Talk about selling ice to the Eskimos, there’s a company called Primitive Gatherings that can talk grown up ladies into buying a bag of sand literally a 100’ from the beach. The real irony was that I spent about an hour shoveling sand over at Garrett’s house the same time she was at the show buying it. I boycotted the Oscars too – there’s just not the correct diversity among the nominees to match national demographics. For the same reason I’m boycotting the NBA and the NFL and most major college sports. I’d probably boycott soccer based on over representation of Hispanics but I don’t watch it anyway so a boycott would be meaningless. Big surprise this morning. 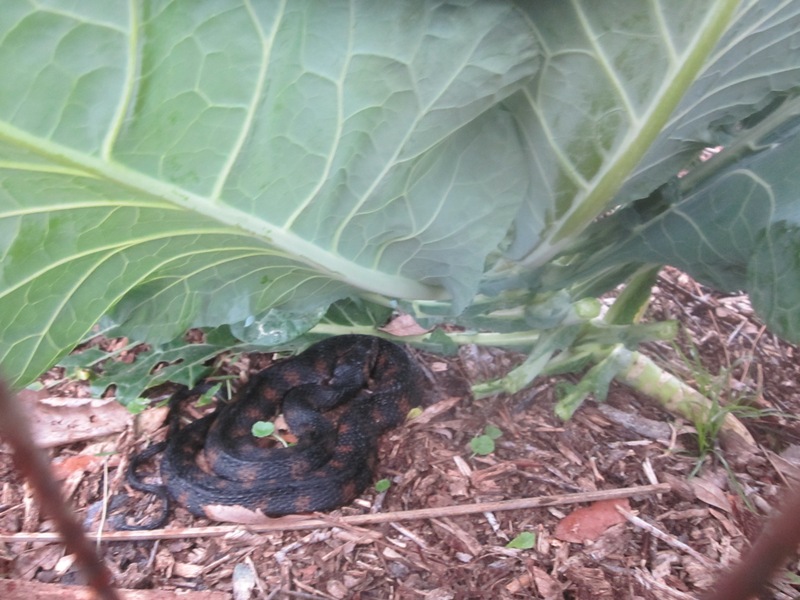 I went out to the garden to pick the greens for Nancy’s bridge club and was clipping collards along the fence when I noticed a coiled snake about 6” from my hand. Now I know the stents in my heart are working! I think the snake is a corn snake or maybe a pine snake but for sure, nothing poisonous. Still, it was an eye opener. I avoided that one plant but continued picking for the crowd. I don’t recall ever seeing the lake this high in mid February. I guess it’s El Nino or maybe it’s the amount of rain we’ve had during the normally dry season. I don’t like the idea of going into the traditionally wet season with a full lake but we’re not flooding or anything. I just wish the fishing was better – following pic notwithstanding. 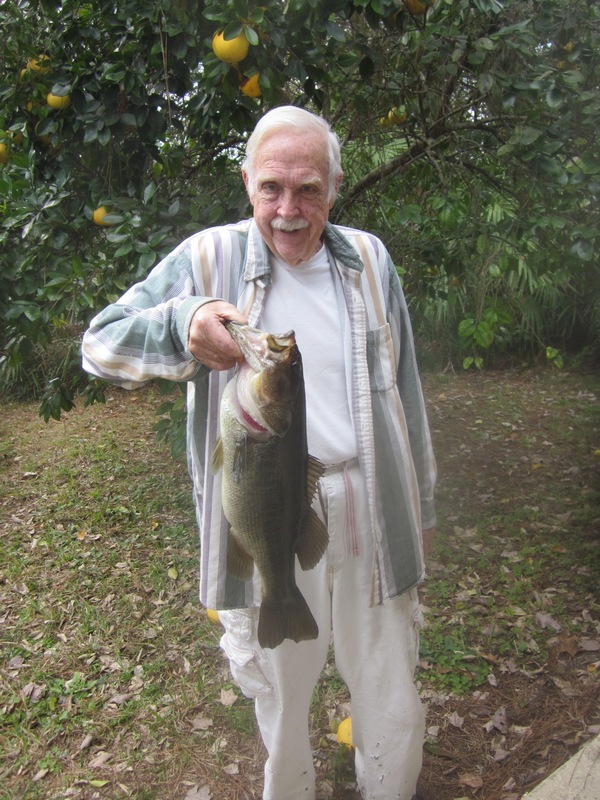 Actually the fishing is decidedly better than it has been and I’m starting to catch a few decent fish off the dock and around the lake – just a notch above bad. The weather this winter has been unusual and I think the fish just aren’t sure what season it is yet. Big event – I got a store bought haircut – the first in about 12 years. Since we moved to the jungle, I was ok with the wild look and Nancy was good with the scissors. With her impaired vision, it’s a bit trickier – ears and eyes on the line. I didn’t want to hurt her feelings by looking elsewhere but I think it was putting her under too much pressure. Hopefully things will get back to normal soon enough; i.e. her driving and cutting hair. Ribolitta – Italian cabbage soup. Nancy’s latest soup masterpiece with loads and loads of garden veggies including a head of cabbage (of course), a pound of kale, and a pound of swiss chard. Plus the standards – potato, onion, garlic, tomatoes, etc etc. Cannelloni beans. The recipe doesn’t call for sausage but we decided that couldn’t hurt. A pound of kale and a pound of chard is really quite a bit so this soup is definitely a winter gardeners delight. I was really surprised how good it turned out. 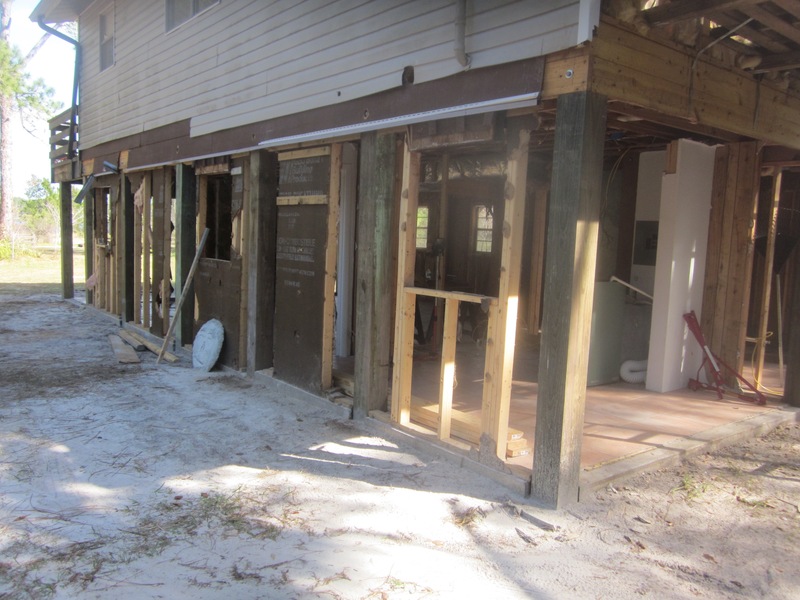 We’re starting to make some visible progress on the remodel/rebuild job on George’s grandson’s place here at the lake. The new target is to be finished by Thanksgiving. Historically the place was built off site as a beach house up on stilts. Circa 1980. Somewhere along the way, an owner decided to frame in the lower area and make it a two story place – converting a 750SF place into a 1500SF home. 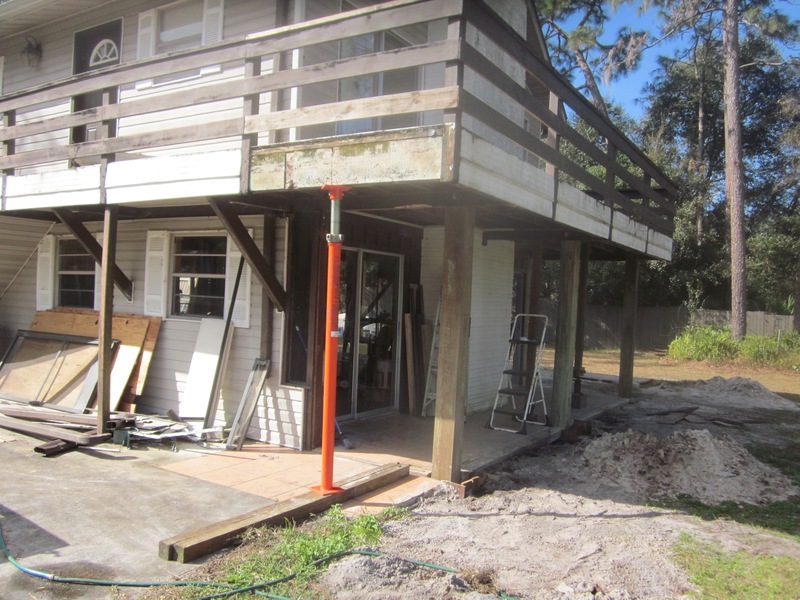 The plan was to gut the interior and remodel it into a 3 BR, 2 bath bungalow but as the siding was removed on the lower part, it was obvious that the 8” x 8” posts holding it up were totally rotten. You could punch a hole completely thru with a screw driver. That changed the scope of the job from a simple remodel to a repair and remodel. 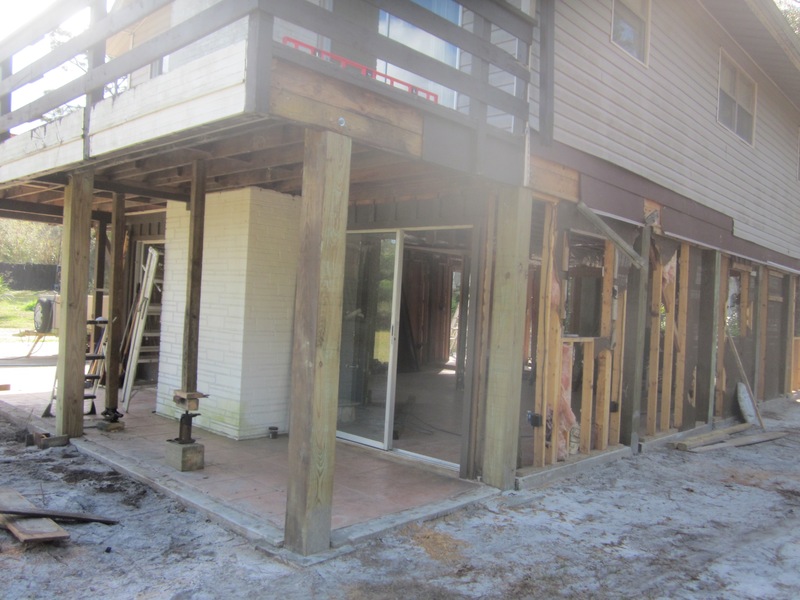 As it turned out the extent of the rot and termite damage pretty much made the job a rebuild. The biggest hurdle (so far) was replacing all the structural poles – 13. All the 8” x 8” posts are installed. We ended up installing 12 posts, each was 12’ long and weighed several hundred pounds. The one’s we removed were unbelievably rotten – amazing that the structure could still stand. 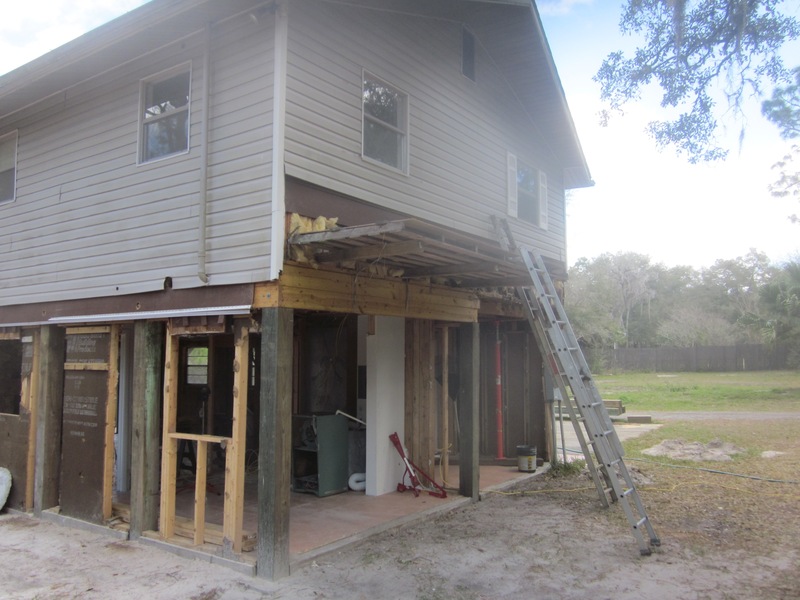 We were hopeful that when we tore off the siding on the upstairs half of the house, the basic structure would be sound but on the south side no such luck – the 4” x 4” posts between the floor and the roof rafters are just as rotten as the lower poles. We’re hoping that this is not the case on the other 3 sides but so far, nothing but the worst case has been the reality. By the time we’re done, the entire structure will have been replaced – one board/post at a time. The pic’s below show the installed posts from several viewpoints. Each post drops below the surface 3’ and is encased in concrete – so quite sturdy. You can also see they’re bolted into the floor joist above, tying it all together. As you know, I bury lots of fish carcasses in the garden as fertilizer. Although fishing in our lake has been super poor, my neighbor has been doing well at other lakes so I get an occasional load to bury. However the last two times has resulted in a critter digging them up overnight. I buried them deeper than usual to no avail so tried another trick – burying them and putting a brick on the spot. In the past that has worked but when I went out this morning, the bricks had been cast aside and the fish dug up. This is going to be war. My indoor garden is going strong. It’s on the kitchen counter to take advantage of the lighting under the cabinets so my bride is not wild about the whole thing. The current population is 22 tomato plants, 6 green peppers and 4 eggplants. They’re all seedlings that germinated in the last couple of weeks and are too weak to withstand the rigors of the great outdoors. I planted the seeds when we were having an extended run of global warming and intended to move them outside as soon as they germinated but global warming was replaced with polar vortex………… On top of that we’ve set a record for rain in January and on into February so my best judgement tells me that kitchen belongs to the seedlings. It seems symmetrical that they start their life in the kitchen and end up there as din din. Finally broke the dry spell with the bass below. Got him/her off the dock using a live bluegill for bait. It weighed about 6 pounds. I decided to let it go to keep the population of big ones higher. The next day, using the same technique, caught one about 4 pounds so I’m definitely onto something. I used to fish this way quite often in the winter a few years ago but for some reason got away from it. I enjoy it when it’s warm and sunny after a cold morning start – take a good book or the WSJ and just enjoy the day. If you catch a fish, that’s a bonus. The rod and reel I use are my oldest bait casting outfit. The reel has to be at least 50 years old. It’s a knockoff of the famous Ambassador 500 marketing exclusively by Sears under the Ted Williams brand name. That dates it back to the 60’s. I wouldn’t be surprised to find this is the only one of it’s type and age still landing an occasional 5 pounder. Nancy got behind the wheel again for the first time in months. She’s seeing better than she was before all this started so we were pretty confident she could make the short drive from our house to downtown Pierson – about 3 miles. The Toyota was in the shop and George was not available so we decided to give it a try. No problem. She drove to the shop with me at shotgun and I followed her home. She drove like most Florida senior citizens. I wouldn’t have any concerns with her driving when necessary but the plan is still for me to be the primary driver until the doctor gives her the green light. So Nancy passed her test drive – the Toyota, not so much. When I got a couple miles down the road, the check engine light came on. Back to the shop. Is it possible to have too much broccoli? Yes. I don’t think I planted more than usual but it sure seems that we’re getting more out of it. Each plant puts out a single large head just like you see at the produce market but what you don’t see are the small, side heads that grow out after the main head is harvested. You pick the side heads and, as if by magic, more side heads appear within just a few days. I think my neighbor is picking less too. They’re not big on anything green other than cucumbers. They have picked a little kale and maybe some collards but not much beyond that even though there are enough of both to feed 6 families. oh well. Interestingly, what hasn’t been producing (yet) are the cauliflower plants. Why that’s interesting is that all of a sudden the vegan crowd has latched onto cauliflower and the price has gone totally out of sight – I’ve seen it as high as $8 for a single head. I guess much of it is normally grown in Arizona and California but both areas have cut way back due to water issues. I really don’t know why my plants just aren’t as good as usual – you’d think if the broccoli were doing well, their white sister would too but mine must have gotten the word from the west to hang back this season. But all in all, I think I did a much better job this year of pacing the planting so that the harvest is more continuous. Unless we have weird weather, we should still be picking cabbage, broccoli, cauliflower, spinach, chard, peas, carrots, collards, kale and lettuce until late March. And all six of the summer squash plants are thriving under the protection of the water walls so it’s possible we’ll be eating squash just about the time I’m normally planting the seed. It’s usually a race between us and the bugs as to which gets to eat squash. Last year was theirs. My plan is that this extra early start will give us the edge and to further insure that, I’ve planted a few onions and garlic plants right alongside the squash. 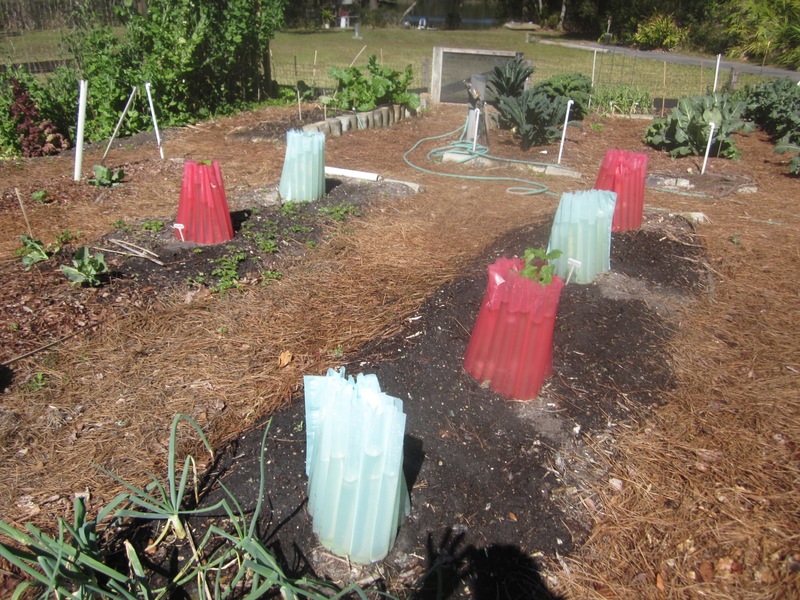 The theory is that those particular plants will ward off the feared and dreaded aphids. I read that nasturtiums will also scare squash bugs so I’ll be putting nasturtium seed all around the squash plants.